DLD40: 2-dim Delay-Line-Detector incl. microchannel plate set with 25µm pore and open area ratio 60%. 2x 1.5 mm thick, L/D 2x 60:1, 50 mm outer diameter, resistance matched in chevron configuration. Active diameter >42 mm, quality linear diameter 40 mm. Detector size: diameter 95 mm, depth 30 mm. The rate tolerance of the detector is at least 1 MHz. DLD40_f: ...OAR 90%, 12 µm funneled + 25 µm pore, 0.7+1.5 mm, (2x 60:1) non-matched. DLD75: 2-dim Delay-Line-Detector incl. microchannel plate set with 12 µm pore and open area ratio 70%. 2x 1 mm thick, L/D 2x 80:1, 87 mm outer diameter, resistance matched in chevron configuration. Active diameter >75 mm, quality linear diameter 75 mm. Detector size: diameter 145 mm, depth 30 mm. The rate tolerance of the detector is at least 1MHz. DLD80: … with MCP of OAR 60%, 25 µm pore 2x 1.5 mm thick (2x 60:1) matched. DLD75_f: …OAR 90%, 12 µm funneled + 25 µm pore, 0.7+1.5 mm, (2x 60:1) non-matched. 024 HEX75b: 2-dim Delay-Line-Detector with improved multi-hit tolerance (zero dead time), incl. microchannel plateset with 12 µm pore and open area ratio 70%. 2x 1 mm thick, L/D 2x 80:1, 87 mm outer diameter, resistance matched in chevron configuration. 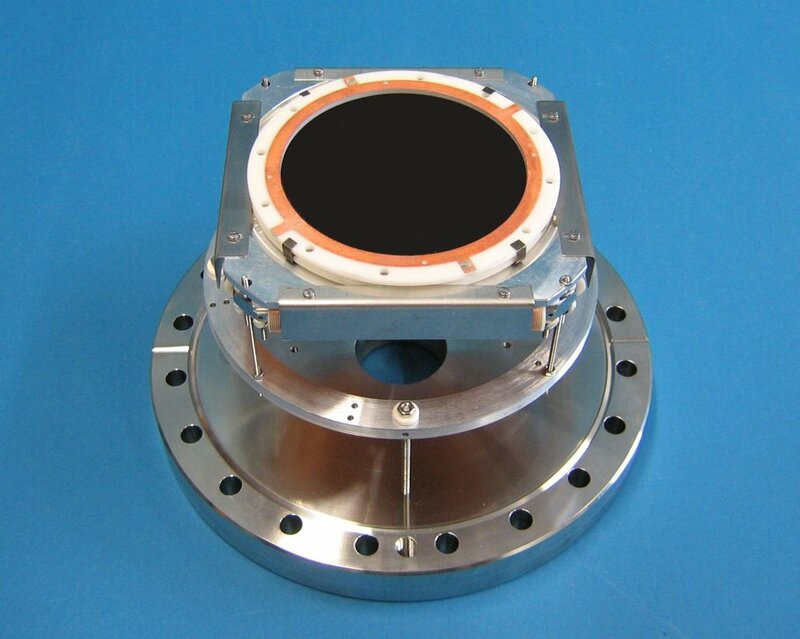 Active diameter of the detector is 75 mm. Detector size: diameter 196 mm, depth 30 mm. HEX40o, HEX75o, HEX120o: 2-dim Delay-Line-Detector with central hole. 026 DLD120: 2-dim Delay-Line-Detector incl. microchannel plateset with 25 µm pore and open area ratio 60%. 2x 1.5 mm thick, L/D 2x 60:1, 127 mm outer diameter, resistance matched in chevron configuration. Active diameter 120 mm, quality linear diameter 115-120 mm. Detector size: diameter 196 mm, depth 30 mm. The rate tolerance of the detector is at least 1 MHz. 028 DLD150: as DLD120, but with active diameter 150 mm. Detector diameter 245 mm. 027 HEX100: 2-dim Delay-Line-Detector with improved multi-hit tolerance (zero dead time), incl. microchannel plate set with 25 µm pore and open area ratio 60%. 2x 1.5 mm thick, L/D 2x 60:1, 127 mm outer diameter, resistance matched in chevron configuration. 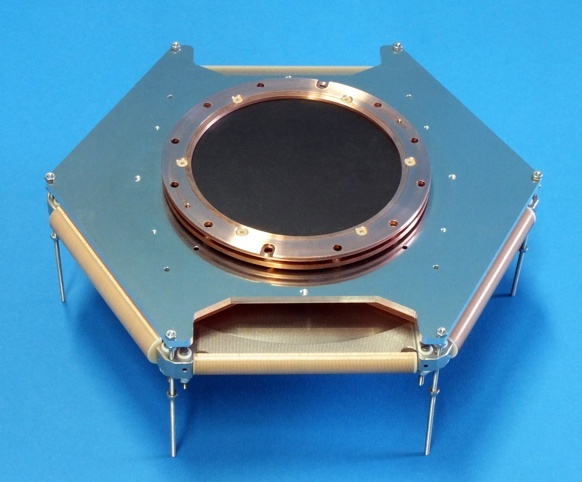 Active diameter of the detector is 115 mm, triple layer area diameter > 100 mm. Detector size: diameter 246 mm, depth 30 mm. 004/005 DET40/75: Particle-counting detector with metal anode incl. microchannel plate set with 12 µm pore and open area ratio 70%. 2x 1 mm thick, L/D 2x 80:1, 50/87 mm outer diameter, active >40/75 mm. Detector size (without flange mounting): diameter 66/106 mm, depth 10 mm. Maximal count rate at least 1 MHz. Please inquire for timing detectors with other active diameters, e.g.25 / 120 / 150 mm. RS-DET40: flange-mounted 40 mm MCP stack (Chevron) on CF100 (ICF153) with resistive screen for image charge signal pick-up on air-side read-out electrode (modular, e.g. delay-line, Wedge&Strip, Pixel for imaging). Includes signal feedthroughs and MCP timing pickup (as FT4TP). 061 DLD40X: 2-dim Delay-Line-Detector based on the RS-DET40 with external delay-line anode LC40Hex. Includes case and signal transformers (as FT12-TP). Does not require BA3 and only one HV2/4 module (+HVT) in all operation modes.